We know you're busy, so make your morning easy! 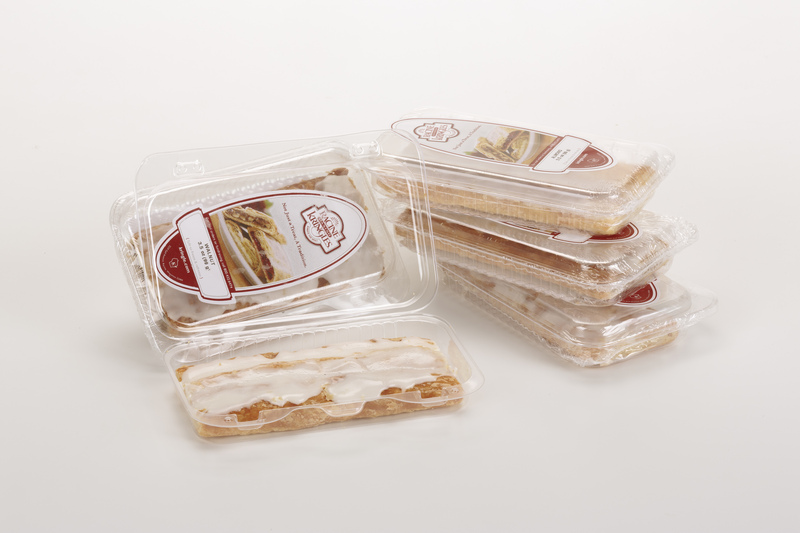 This gift pack comes with 12 single serve Kringles (3.5 oz. 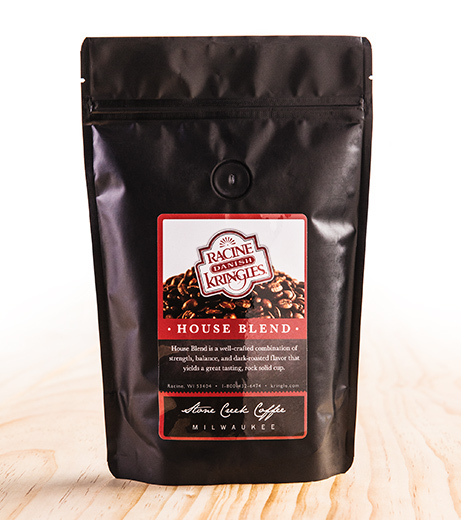 ), Stone Creek ground coffee bag (8 oz. 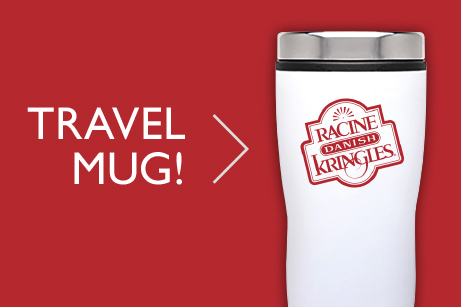 ), and a travel mug. 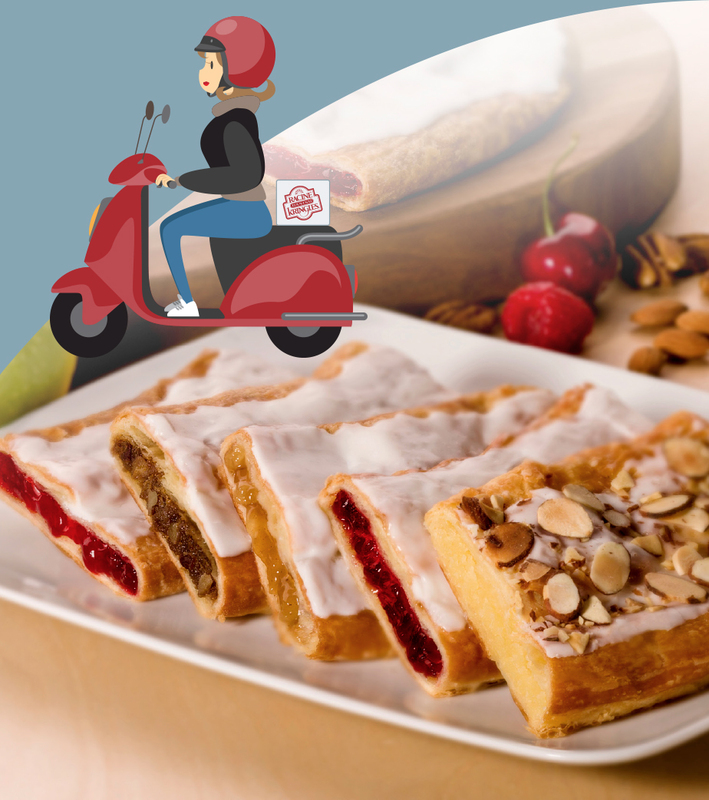 Kringle and coffee are guaranteed to get your day going! Sugar, Wheat Flour, Margarine (Interesterified Soybean Oil, Water, Salt, Mono- and Diglycerides, Colored with Annatto/Turmeric. Calcium Disodium EDTA preservative. Artificial Butter Flavor. Vitamin A Palmitate added. ), Brown Sugar (Sugar, Molasses, Cane Syrup), Raspberries, Eggs, Corn Syrup, Modified Corn Starch, Contains 2% Or Less of the following: Soy Protein, Soy Lecithin, Yeast, Dextrose, Salt, Citric Acid, Palm Oil, Natural & Artificial Flavors(Milk), Preservatives (Potassium Sorbate, Sodium Benzoate, Tocopherols, Calcium Propionate), Guar Gum, Gellan Gum, Beta Carotene, Calcium Carbonate, Maltodextrin, Agar-Agar, Corn Starch, Cinnamon, Malted Barley Flour, Color Added. Sugar, wheat flour, margarine (interesterified soybean oil, water, salt, mono- and diglycerides, colored with annatto/turmeric. Calcium disodium edta added as a preservative. Artificial butter flavor. Vitamin a palmitate added. ), apples, corn syrup, eggs, modified food starch, contains 2% or less of the following: liquid sugar (sugar, water), salt, corn syrup, soy lecithin, soy protein, yeast, dextrose, sodium benzoate, citric acid, natural & artificial flavors, potassium sorbate preservative, soy flour, canola oil, tocopherols preservative, cinnamon, calcium carbonate, partially hydrogenated soybean & cottonseed oils, maltodextrin, agar-agar, color added, calcium propionate, xanthan gum, malted barley, corn starch, spices.